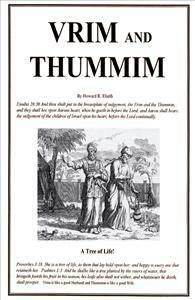 Vrim and Thummim are vital a part of everybody's life on planet Earth, yet very few people have ever heard of these terms. Still fewer understand what Vrim and Thummim means. Vrim and Thummim are at the heart of every thing that we do, yet few can define these important terms. The first time we come across these terms in the Bible, it is in Exodus 28:30. In this verse we note that the Vrim and Thummim, which represent spirit and trueth, are placed between the Breastplate and the heart of the high priest. When Jesus spoke that the Father was seeking people who were qualified to worship him, he was looking for people to worship him in spirit and in trueth. Vrim is spirit and Thummim is trueth.